In June this year, a rare hail storm hit the outback town of Alice Springs in central Australia. The iconic red, dusty landscape of the Alice was turned a frosty white while drivers were forced to contend with roads covered in a slippery, icy slush. No doubt, a new experience for many Territorian drivers more accustomed, instead, to driving on roads covered in red bulldust. Ice in the Alice, however, is just one example of the freakish weather reported down through the years. Take, for example, the freak wind gust that flung a 600 pound beast of burden into a tree, brown outs, whitewashes, home-invading fireballs and the subtropical ice storm that froze poor unsuspecting goannas in a swamp. Australia certainly has its weird and wonderful weather. First up, a case of being in the wrong place at the wrong time for a poor unfortunate beast of burden. On 28 January 1922, The Port Macquarie News and Hastings River Advocate reported on the untimely death of a 600 pound bullock that fell victim to a freak gust of wind and a forked willow branch. “It is seldom that bullocks leave terra-firma and take to willow trees,” stated the Advocate. “But a beast on Mr. Dan McDonald’s Rossiville property (Goulburn district) was last Thursday forced to change its habits, though it lost its life in doing so. The bullock in question, a full grown animal weighing about 600 pounds was grazing on the bank of the Wollondilly [River] when a big windstorm burst over Rossiville. “At the critical moment, when the willows were being lashed by the gale, and bending double by the blast, the doomed animal reached a spot above which a forked branch waved up and down. A terrific gust roared through the willow, the branch swooped earthward, and the fork descended on the bullock’s shoulders, gripping it from neck to flank and lifting it in the air. 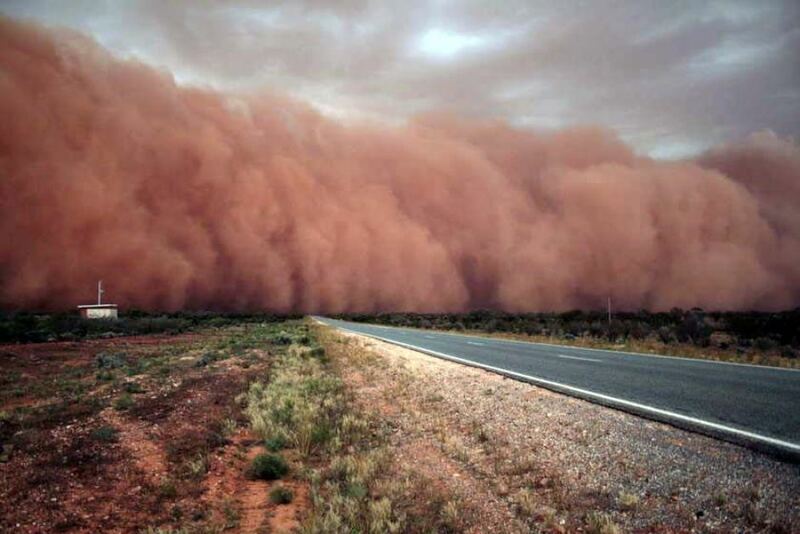 While dust storms are certainly nothing out of the ordinary in many parts of Australia, the Mudgee Guardian and North-Western Representative of 30 December 1937 reported on a rare coincidence concerning the arrival of not one, but two dust storms on Christmas Eve two years apart in the town of Dunedoo. The brief dust storm, which came in from the east, “quickly covered everything, and many businesses closed their doors temporarily. It has been reported that the storm, gathering in intensity, reached Coonamble at 9 p.m. that night. The Murray Pioneer and Australian River Record reported that the sky turned brown for an hour before a strange storm hit the Renmark district of South Australia during Christmas of 1928. “The storm which passed over the district on Friday night was the weirdest thing seen in this district for many a day. The sky was brown for an hour before the storm broke and a little rain fell (the content of which was largely mud). It’s also been raining mud, fish & frogs in Strange skies: frog falls, heavenly mirages & great balls of fire. A dust storm of a more appealing colour was recorded in western NSW in 1925 according to the The North Western Courier of 25 November. “A rather strange phenomena is reported from ‘Rosedale,’ Miandetta, near Nyngan, the residence of Mr. G. Teale. One night last week a storm of white dust and rain occurred at the homestead. According to the article, nobody knew where the white dust had come from. It’s rare that you’ll find ice outside of an esky filled with beer or a freezer full of fish in subtropical Rockhampton, Queensland. But according to Adelaide’s News on 11 December 1923, a rare weather event turned swamps into ice sheets and led to the untimely deaths of a number of goannas. “Today, large lumps of jagged ice fell during the progress of a storm between Raby Creek and Eastbrook stations,” the News reported. From across the Tasman came the following account from a Balclutha correspondent as retold in Hobart’s Daily Post on 9 April 1912. “A somewhat remarkable phenomenon was observed on Tuesday. “An easterly rain fell more or less heavily all the forenoon, and just about midday there was an extra heavy downpour of misty, thick rain, after which the ground was found to be in places thickly covered with particles of a jelly-fish-like substance. The largest about the size and shape of the fingernail on the little finger. On 8 January 1923, the Warwick Daily News reported from Brisbane that “at midnight on January 3 certain peculiar storm phenomena were noted there”. 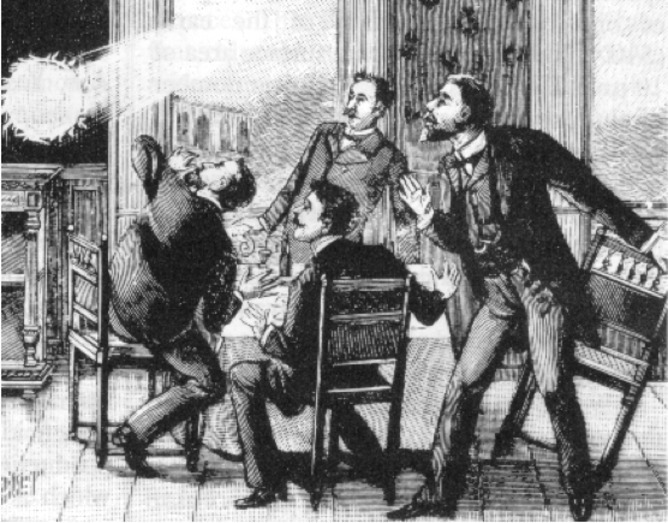 Fireball tears through house: A case of ball lightning? The Geelong Advertiser of 20 June 1907 included the following account of a fireball traversing the heavens during a thunderstorm “of an unusually heavy character” in Sydney’s eastern suburbs. “From the city the direction taken by the ball or meteor appeared to be over Paddington, and towards the north-east. The fireball seemed to move with an undulating motion, and it left a brilliant trail of fire in its wake. It made a loud hissing noise that could be heard all over the city. “Eventually the brilliant visitant disappeared in the direction of Watson’s Bay, having apparently gone out to sea. “Mr. Poole, a resident of Glebe-street, Paddington, declares that a great fireball passed right through his house during the progress of the storm. He says, it burst in through the back window, ‘rolled along the passage,’ which was an unusually long one, passed through a doorway into a front room, and burst its way out by a front window. And a ball of fire startled a family taking shelter indoors during a violent thunderstorm a few years earlier as reported in the Windsor and Richmond Gazette on 11 November 1899. “During the awful thunderstorm on Tuesday, Mr J. Smith of Fitzgerald-street, and his household had a strange and startling experience. With his granddaughter he was seated near a fireplace, when a ball of fire came down the chimney, and for a while the room was aglow with a beautiful blueish light. The electric ball exploded and its elements appeared to pass out of the room, leaving the occupants dumbfounded, but uninjured. “No damage was done to the interior of the room, and a strong odour of sulphur was all that the strange visitant left in its wake. Mr. Tout’s residence, adjoining Mr Smiths, got some of the force of the shock. The chimney stack was struck by the electric current, and though little damage was done, the inmates received a great fright. More reports of fireballs in Strange skies: Frog falls, heavenly mirages & great balls of fire. Finally, Grafton’s Daily Examiner reported a waterspout at Mountain View on the Clarence River near Grafton NSW on 8 November 1923. Although not something you see everyday, there’s nothing too uncommon about a waterspout off the coast. This waterspout, however, was reported over 50 kilometres inland from the coast. “Out Mountain View way, Monday’s storm was responsible for a strange phenomenon. At Carr’s Creek the hail was very scattered and did little damage, but at Mountain View the storm was much more severe, and a waterspout, an unusual occurrence a way from the sea, was seen by several observers above the Southhampton punt. “Eye-witnesses state that the dark green-coloured whirling column was distinctly outlined against the paler hues of the turbulent sky,” reported the Examiner. Have you checked tomorrow’s forecast? October 25, 2015 in Natural phenomena.